Today's creative discussing what the mambi motto 'live creatively' means to her is Rachel Nanfelt. How long have you worked at mambi, and what is your role? I've worked at mambi for a little over seven years and am one of their artists / graphic designers. I get to spend my days drawing and painting, creating patterns for papers, stickers and new products. One of my favorite things about my job is to brainstorm a new look or product. I love being a part of the process that brings products to market. It's exciting to finally see the 'real thing' of a product you've helped design. What does the mambi motto "live creatively" mean to you? For me, the motto encapsulated what we hope our products help others to do. It's an encouragement to think outside the box and try new things. Usually in my job I see this applying to creating art...trying new techniques, making a lot of work (some of it bad! ), learning and trying new ways to craft, trying new styles of illustration or lettering. To live creatively, you have to be open to trying new things and to the likelihood of failure, but with failure the possibility that you could stumble upon something even cooler than you imagined! 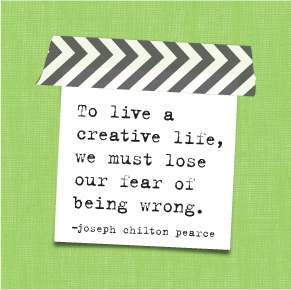 In what aspects of your life would you say you live or have lived creatively? Luckily, I have a job that encourages me to live creatively! Much of what I spend my day doing is creative on some level - drawing, painting, laying out artwork into stickers, creating patterns, even brainstorming new products...and I love that! But as an artistic person, it's actually pretty hard for me turn off my creative energy...it fuels me! I really just love to make thing - designing wedding invites, painting flowers, doodling obsessively, sewing quilts, planning beautiful parties, and even cooking is a chance to be creative in my mind. My husband and I are expecting a baby soon, so my latest creative project was to make some swaddling blankets for the new little guy. I wanted something unique, so I bought fabric and 'dyed' my own patterns. It was a really fun process, and although I would do a few things differently if I did this project again, it was exciting to try something I've never done before. How would you like to live more creatively, or any advice to others seeking to live more creatively? I think my advice to others seeking to be more creative is to be open to trying new things - in how you create art, in cooking new recipes, in trying new experiences -- in anything! Let your imagination run wild, say 'yes' more often than 'no', take risks and see where it all leads. Be okay with failure or mistakes or the long path. Creativity can be a really messy thing, but it has the potential to resolve itself in really awesome ways, or lead you to something unexpected and wonderful. You can also find Rachel's work at minted. com.